Israeli Ambassador to the UN in Geneva slams international community for believing Hamas' tale, allowing abuse of civilians. 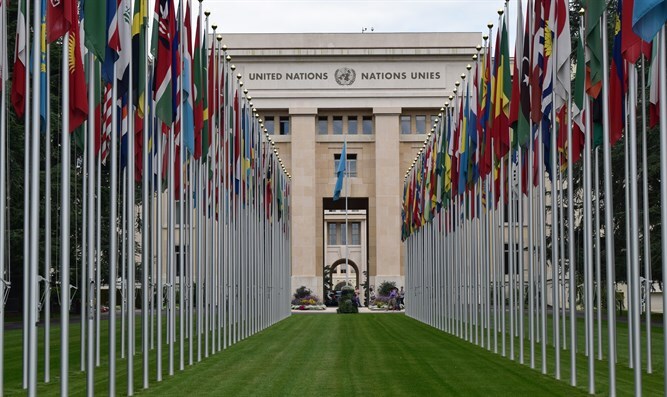 The United Nations Human Rights Council in Geneva began a discussion on the conflict between Gazan terrorists and rioters, and the IDF. According to the UN High Commissioner for Human Rights Zeid Ra'ad al-Hussein, even if some of the protesters were violent and attempted to breach the Gaza-Israel border, Israel's reaction was "wholly disproportionate" to the threat, and requires an international investigation. "Killing resulting from the unlawful use of force by an occupying power may also constitute willful killings, a grave breach of the Fourth Geneva Convention," he alleged. In fact, at least 50 of the 62 killed on Monday in Gaza were, by Hamas' own admission, Hamas terrorists. In addition, Israel has not occupied Gaza since the expulsion of its citizens from the area in 2005. ‎Meanwhile, Israeli Ambassador to the UN Geneva headquarters, Aviva Raz-Shechter, responded: "Hamas cynically abuses the Gazan population." "It's sad that so many countries fall for their false tale claiming that the protests are non-violent."